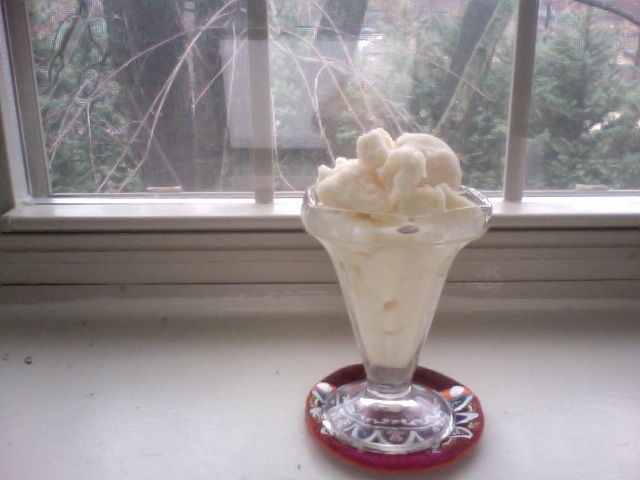 Last night I made an organic orange sherbet. I used Uncle Matts organic calcium fortified orange juice, Whole Foods brand organic sugar, Whole Foods brand organic lemon juice, and Organic Valley whole milk. Uncle Matts orange juice is a blend of organic Hamlin oranges which have a high vitamin c content, and Valencia oranges which have a sweet juice. All oranges come from growers in the United States. Peel oil or flavoring is not added to the juice, instead the farmers harvest the juice at the correct time for maximum flavor and low acidity. Not only is it organic certified but it is also Kosher certified. This means that a rabbi must oversee the equipment and processes of making the juice to make sure that it is sanitary and Kosher. The PET 1 plastic that they use for the containers is Bisphenol A free and easily recyclable. Bisphenol A can increase obesity, effect fetal brain development, and can increase breast cancer risk. I have used Organic Valley butter before and am now using their whole milk. It has a decent sell-by date and does not seem as corrupt as Horizon Organic. Organic kiwifruit from New Zealand …guilt? Yesterday I bought a bag of organic kiwifruit from Trader Joes. The brand is Zespri, the world’s largest marketer of kiwifruit also known as the Chinese gooseberry. Zespri is certainly not an all organic company. Similar to Dole, they offer the organic option for consumers who are looking for that type of product. Zespri complies with not only the USDA organic standards but other country’s standards as well. They market this organic fruit to Europe, Britain, Japan, and the United States. Fruit is held in environmentally friendly coolstores until shipment. However they do not describe how the storage system is environmentally friendly. A goal for Zespri for 2010 was to reduce emissions. They also encourage natural pest and weed management but do not require it for the non-organic fruit. I feel guilt because I know that it must take a lot of fuel to transport the fruit from New Zealand to the Trader Joes in Towson, Maryland. However it feels good that such a large company is at least realizing it’s impact and making the information public. I have been buying the Purity organic brand pomegranates every week this year. I love them! They are only available from September to December. Purity Organic’s fruit company is called Pacific Organic but the sticker on the actual fruit says Purity. Ten percent of their dividends is given back to the organic community and they indicate this as being the organic farmers. The company uses PET1 because it is easily recycled and lighter than glass making it easier to transport. It is recycled into materials for carpet and other plastic goods. The fruit comes from parts of Latin America and areas of the western United States. 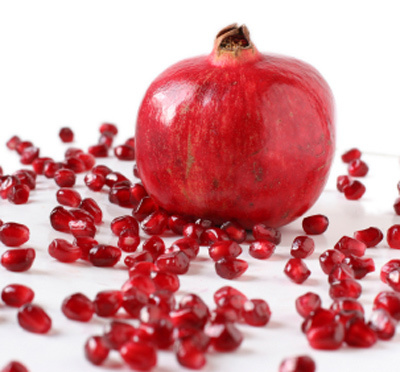 The pomegranate comes from the United States. According to Andy Nelson of “The Packer” Purity Organic increased it’s pomegranate volumes ten times this year. They planned to sell over 100,000 boxes of the pomegranates. They happen to be the largest producer of organic pomegranates. Now the company is also selling the loose pomegranate seeds as well. For Thanksgiving I brought an organic apple pie and organic Brussels sprouts dish to my grandmother’s house. For the pie crust I used Whole Foods brand organic white flour and sugar, Spectrum organic brand vegetable shortening, and Whole Foods brand organic unsalted butter. Spectrum has showed that they are an ethical family owned company from what I have seen on their website. Spectrum’s shortening is made with organic expeller pressed palm oil. It is non-hydrogenated which makes it more healthy than other brands of shortening. The process of hydrogenation adds bad trans fats to food products. Trans fats are nearly impossible for the human body to break down and they may be a leading cause of heart disease. The reason why companies use hydrogenation is because it extends the shelf life of food products. Expeller pressing is “chemical-free mechanical process that extracts oil from seeds and nuts using a screw type machine” according to the Spectrum Organics website. Spectrum has boycotted the Canadian Fishing and Seafood Industry for killing baby seals to show their “stewardship”. They farm organically and on their website have a nice section on biotechnology and the harms that it causes. The palm oil used in the shortening is sustainable according to Spectrum. A percentage of the company’s revenue is given to their workers’ welfare association. Normally palm oil production involves clearing out large areas of land and disrupting the local people’s lives. Originally just a family brand, Spectrum has now joined the huge Hain Celestial brand. For the filling of the pie I used three organic Granny Smith apples and four organic Mcintosh apples. 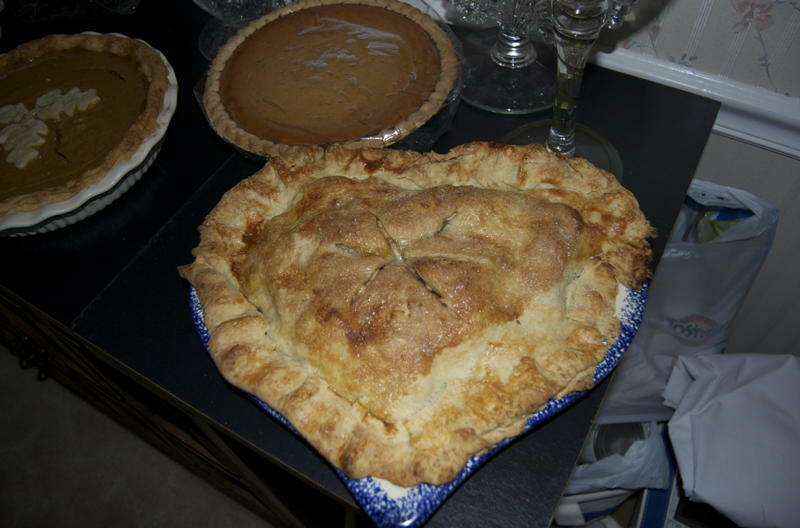 Using two different types of apples prevents the pie from becoming watery and balances the flavor. I purchased the apples from Whole Foods, they were grown in the United States. For the Brussels sprouts dish I used Napa Valley Naturals organic balsamic vinegar, the Whole Foods brand butter, Applegate Farms pancetta, and Brussels sprouts from Whole Foods. Napa Valley Naturals is a family owned business founded by Kendall Cook. It produces organic and natural vinegars, oils, and now cooking wines. Ten percent of revenue is donated to “groups that support environmental preservation, sustainable agriculture practices, hunger prevention, and community-based health initiatives”. They have also donated 166,000 dollars to Susan G. Komen for the Cure, which supports breast cancer. All Napa Valley Naturals products are vegan, Kosher, and gluten free. Their balsamic vinegar is from the Modena District in central Italy. It is “Chemical free, sodium, cholesterol, and GMO free.” It also is free of caramel coloring and added sugar. However it does contain natural sulfites. There is also naturally occurring lead in the balsamic vinegar. Many companies add sulfites to wine and vinegar as a preservative, but this balsamic vinegar has naturally occurring sulfites which come from the grape skins. According to the Napa Valley Naturals’ site, lead is absorbed by everything which grows in the ground. Applegate Farms produces organic meat and natural meats. They make several promises for their products such as, their animals are never given antibiotics, livestock eat a completely vegetarian diet, cattle are grass-fed, animals grow at their natural rate- they are not given hormones, products are minimally processed, products never contain artificial nitrates or nitrites- celery juice and sea salt are used as preservatives, meat is gluten and casein free, even the hot dogs are made from whole muscle meat- no mystery. Products are “uncured” which means that they have been preserved without a chemical agent. Pancetta is an Italian style bacon. There is a three month drying period in the production of pancetta which gives it a different flavor when compared to traditional bacon. Today I made coconut bread using all organic ingredients. 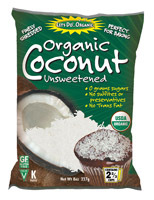 I managed to find unsweetened shredded coconut, which I loved. It is very different than the sticky sweet mess found in the baking aisle of your average grocery store. The brand is called Lets Do…Organic and produces organic gummy bears, ice-cream cones, tapioca, and corn starch in addition to the coconut flour, flakes, and shredded coconut. The coconut contains no added sugars so that a consumer can choose how much, if any, sugar to add to what they are making. The brand advertises that the coconut contains natural fiber. There are also no preservatives or flavor enhancers, the ingredients list reads organic coconut (dehydrated and shredded). Bakers, a Kraft brand, also makes shredded coconut, except it is sweetened and mentions the moistness rather than health benefits. In 2004 it was given the best taste award for shredded coconut. The winning ingredient list of this shredded coconut reads: coconut, sugar, water, propylene glycol, salt, and sodium metabisulfate. Propylene glycol is a preservative commonly found in makeup and skin creams. I believe that Bakers uses it to retain the moisture in the coconut. Unfortunately it can cause heart, kidney, and liver problems. It is very cheap, it does what it is supposed to, and it is legal. Gladly there are other options like the great organic coconut pictured above. My bread turned out great and I will be purchasing from the Lets Do…Organic brand again. It tastes like White Zinfandel.. faintly. It has a beer like effervesence which is naturally occuring. Which I do not like. But it is supposed to be very healthy. It’s called Synerg- organic and raw- Cosmic Cranberry. It is a kombucha drink. “Kombucha is a handmade Chinese tea that is delicately cultured for 30 days. During this time, essential nutrients form like: Active Enzymes, Viable Probiotics, Amino Acids, Antioxidants, and Polyphenols. All of these combine to create an elixir that immediately works with the body to restore balance and vitality. The ingredients are organic raw kombucha and pure unsweetened cranberry juice. Why not organic cranberry juice? It does exist. I guses because the company knows it can get away with it since they use 95% organic kombucha. The USDA allows five percent of non-organic ingredients in organic products. Cranberrys however, are probably not the best ingredient to have not be organic. The process of harvesting cranberries is very water intensive and the pesticides farmers use just run off into streams when they flood the cranberry field. But this drink has one BILLION Lactobacillus Bacterium and S. Boulardi organisms. That sounds like a lot! Lactobacillus bacteria increases acidity in the large intestine which helps destroy undesirable bacteria. It can also help reduce flatulence… wow! S. Boulardii on the other hand causes flatulence… so this seems sort of counterproductive. But it is a probiotic which is still good for the digestive system. According to the LiveStrong site the side effects of S. Boulardii are : Abdominal swelling, bloating, constipation, fever, flatulence, fungemia (fungal infection disseminated through the bloodstream), generalized skin eruptions, increase or decrease in blood pressure, increased thirst, itching, Quincke’s edema (the rapid swelling of the skin, mucosa and submucosal tissues, also known as angioedema), respiratory insufficiency, sepsis, septic shock, urticaria (hives), white blood cell count increase. So I am unsure of why Synergy would include it in the drink, possibly it is required to ferment the tea. This particular drink actually went through a recall because of alcohol levels in the drink (I bought this at Whole Foods legally). I see nothing on the label about alcohol levels. But soon it will be off of shelves according to MindBodyGreen.com. It will only be for sale in grocery stores which sell alcohol. It has above .5% alcohol, and legally beverages with above that percent must have a government warning on them, which as of now this does not. I searched the label for a warning or just a percent and found nothing. Celebrities like Lindsay Lohen have been seen drinking Synergy so that has increased it’s popularity. 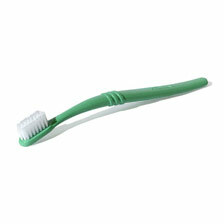 Last year I bought my Preserve brand toothbrush, a toothbrush which is made from Stonyfield’s recycled yogurt cups. Preserve also has tableware and things for the kitchen. The plastic that they use requires less water, oil,coal,natural gas, electricity and produces less greenhouse gases when compared to virgin polypropylene. I like my toothbrush- the curved handle is good for getting to the hard to reach places, and it requires no batteries- which saves me money. As for the yogurt- I do like Stonyfield yogurt. I love how I can enter in the codes from the lids online to earn free things such as organic frozen fruit, raviolis, more Stonyfield yogurt,and chocolate. That does give me incentive to buy their products, however I wonder… could I not just write down codes in the store and not buy the yogurt? That would be wrong, but I could do it if I wanted to. Stonyfield is a very big company, but they work to be environmentally friendly. They recycle with Preserve, make charitable donations (ten percent of profits) to the Profits for the Planet organization, donate waste yogurt to farmers who feed it to their pigs, have a public map of their carbon footprint, and use sustainable packaging. Being an organic company also makes them more “green” since they are not using antibiotics, synthetic growth hormones, or pesticides. They do not stop there. They continue to try to improve the company to make it more environmentally friendly by reducing transportation, decreasing trash, and increasing recycling. As for the final product, I have found that with some flavors the yogurt is “smoother” than others where I find little chunks- which I do not like. 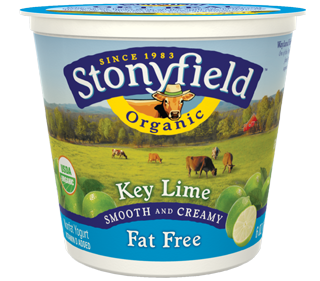 Today I tried the Key Lime flavor for the first time and it was very smooth but had an almost cleaner like taste. I still liked it though. Maybe the flavors with the fruit on the bottom or chocolate on the bottom are the ones that turn out less smooth for whatever reason. Not on subject but- The Immaculate Baking Company’s chocolate chunk cookie received the “Best Chocolate Chip” award from Rachael Ray’s magazine! I agree- it is one of the best pre-made cookie doughs available.